Wondering what to do this spring? Santa Fe, New Mexico is the perfect place to unleash after months of hibernating. Desert your sofa, polish off your hot coco, and book your plane ticket now. It’s finally time to enjoy the sunshine, get active, and explore The Land of Enchantment. Enjoy Santa Fe’s Nature Beauty. Named the cleanest city in the country by the American Lung Association, Santa Fe is the perfect place to enjoy the outdoors. Be sure to plan time to relax in Mother Nature’s beauty when visiting Santa Fe in the spring. This season is the perfect time to benefit from the collection of blooming flowers and plants and fresh mountain air. Amble along scenic hikes, enjoy an ice cream cone in the historic Santa Fe plaza, or rent a bicycle and enjoy a ride on one of many bike trails in Santa Fe. 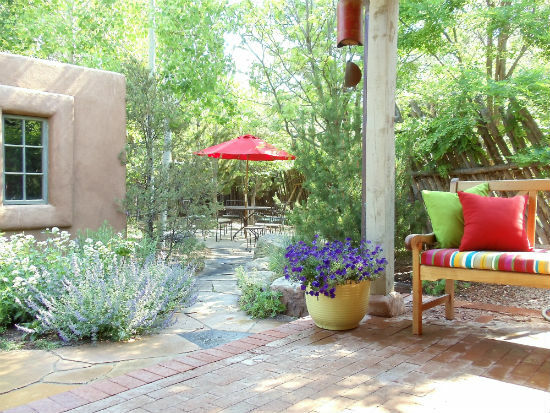 If you crave more, enjoy a Pequeno Tour, hosted by The Santa Fe Garden Club. Starting in mid-April, their private tours exhibit some of Santa Fe’s finest homes and gardens. Have an extra day? Take your senses to Canyon Road; mix natural beauty with man-made creations. A stroll down Canyon Road leads to unique discoveries and innovations. With more than a hundred art galleries in a mile-long stretch, the historic Canyon Road galleries grant a perfect escape for a sunny afternoon with your family or alone. For more information on what to do in the spring and to book your Santa Fe vacation rental contact Adobe Destinations at 505-471-9186. This entry was posted in Uncategorized and tagged =, New Mexico, Santa Fe, Santa Fe Vacation Rentals, spring, spring break, vacation, vacation homes. Bookmark the permalink.